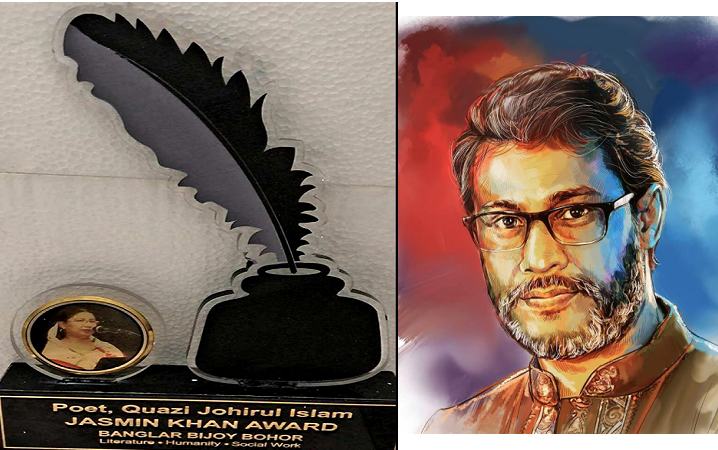 A torchbearer for Bangla literature, Poet Quazi Johirul Islam, was awarded ‘Jasmin Khan Award-2018’ for his significant contributions in Bangla Poetry last month. This award was named after the well-renowned social activist Jasmin Khan, who contributed greatly for the Bengali community in California. Ms. Khan gave her entire life in making the society tolerant and independent. After her death, the Bengali community in California developed ‘Jasmin Khan Trust’ to award those who also contributed significantly for the Bengali community. “Quazi Johirul Islam is one of the most important poets in this era. Not only he writes great poems in Bangla, but also has done tremendous work in translating Bengali poems in English…because of his great efforts, Bengali literature is now well-known internationally”, said a novelist and movie director Ismail Hossain. After receiving this prestigious award, Poet Quazi Johirul Islam said, “Poetry comes from the highest happiness or the deepest sorrow, and if anyone is affected by my poems then it is my greatest award….and that is my inspiration to write poems. This award humbles me, and certainly, this award will send the right messages to others as well. I am grateful to the Jasmin Khan Trust for this award. Many others in North America are working tirelessly to present our literature to the world, and I think they too should be awarded regularly." Additionally, Poet Quazi Johirul Islam shaped “Kriapodhin or Verbless” poems for the Bangla literature. He has written over 55 books, out of which 19 of them are poetry books. For his significant contributions in Bengali poetry, he also received Poet Jasim Uddin Award, Dr. Dinesh Chandra Sen Award, Dream Foundations Awards and many more social, cultural awards.